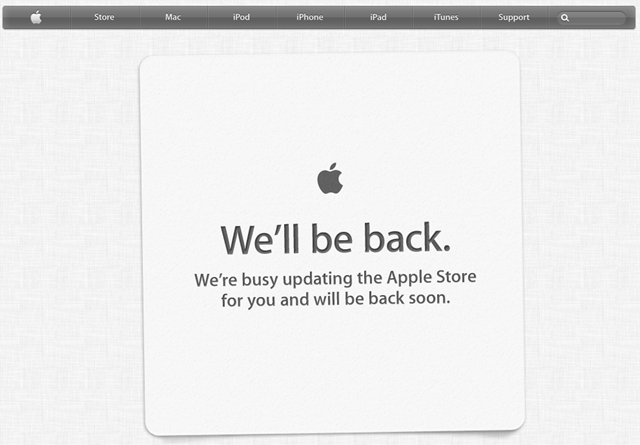 I woke this morning fully anticipating an update to the Apple Store. It IS WWDC-Day, after all. Also not a surprise today is the glut of last minute guessing that’s going on as to what will transpire in just a few short hours at the conference’s keynote speech, given by Tim Cook and likely, the a few more Apple C-Level execs. In an effort not to disappoint everyone, here’s my last minute roll of the dice. No, not yet. However, with the introduction of iOS 6, you can certainly expect something to be said, or hopefully confirmed for a September or October launch. I am expecting a new Dev Preview of Mountain Lion today (DP 4) and an announcement on a release date. You should be able to find a review of Mountain Lion Dev Preview 3 on Soft32, if not now, then it should be posted shortly. You will be able to find a full write up of Dev Preview 4 on BYTE in the coming days. Updated iMacs, Mac Pro, and MacBook/MacBook Pro’s? I am fully expecting a full blown, hardware update on both Apple’s Desktop and portable lines today. Their iMacs are due for a bump. Their Mac Pro line of completely awesome desktops are OVERdue for an update. I’m pretty certain we can expect updates to both those today. Its also long been rumored that Apple will be making big changes to their MacBook Pro line of laptops with thinner, “MacBook Air” based updates coming to both the 13″ and 15″ line of MBP’s. Its been rumored that their 17″ MBP is also going to be discontinued. The 17″ MBP is an awesome machine, but its pretty much a niche item, due to its entry level price – near $3000. I fully expect to this rumor to be realized. I also expect to see transitional models introduced with the current 13″ and 15″ models phased out next year. All that said, this is really just a last minute guess. Despite all the increased rumors and possible accurate leaks leading up to the keynote of WWDC, its still a crap shoot as to whether or not these are accurate. The only thing we’re going to have that’s a certainty is that we’re going to have to wait for Tim to take the stage and tell us what’s new.